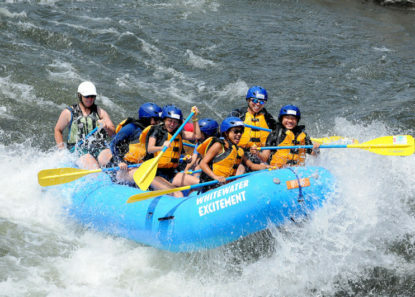 Welcome to a genuine whitewater rafting experience that is fun for all ages. Where Excitement meets Ease – Whitewater rafting on the South Fork of the American River is a sure way to fall in love with the sport. The river offers fifty rapids in just 21 miles, making it an excellent choice for first timers and intermediate river rafters. It promises some exciting Class 3 rapids. It’s a thrilling run that is considered safe for children ages 7+ and adults of all ages and experience levels. “Satan’s Cesspool”: a guest favorite! 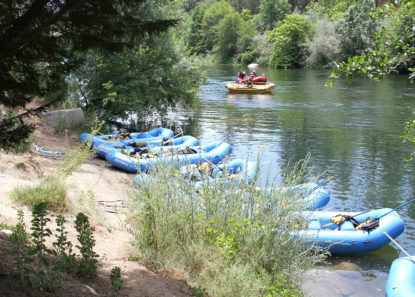 Located in the beautiful Sierra foothills, the South Fork of the American River rafting experience offers plenty of calm water and rest stops along the way, allowing you to take in the thriving flora and fauna of one of California’s most unique ecosystems. The river flows through Coloma State Park, the original site of gold discovery in California in 1848. Service and connection to our guests and to the river experience remains our passion. We are proud to offer some of the most knowledgeable, fun, and attentive guides for your rafting journey along the South Fork of the American River. For almost 40 years, our family-owned company has been taking groups and individuals of every experience level down the river. We’re humbled to have received many positive testimonials over the years. Our trips are customizable according to the needs of your group. 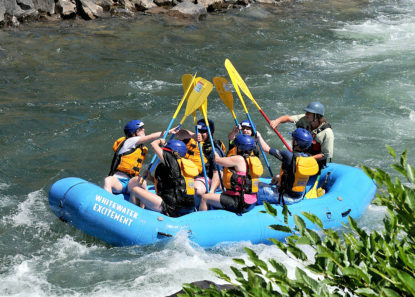 Call us to discuss any accessibility concerns or trip objectives and we will help you design a truly spectacular South Fork river rafting experience. Half-day, Full Day, and Two-Day trips are available. Whitewater Excitement’s private campground offers riverside camping with modern bathroom facilities (hot showers, flush toilets), right on the riverbank. We do not use public campgrounds or off-river campsites for our trips. 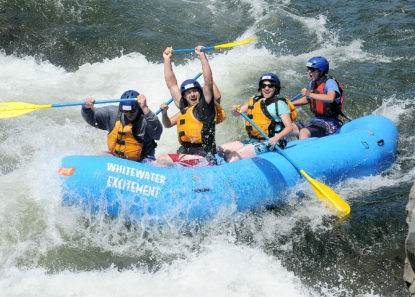 The season for whitewater rafting on the South Fork lasts from early March through October. Spring: Early March through Memorial Day. Higher water flows due to snowmelt and/or rain. The wildflowers are out and crowds are low. Summer: Peak season is June through Labor Day weekend. Temperatures are very warm; hydro-dams give us controlled steady releases for continuous whitewater fun. Fall: Lasts until October. Great flows and warm temperatures. 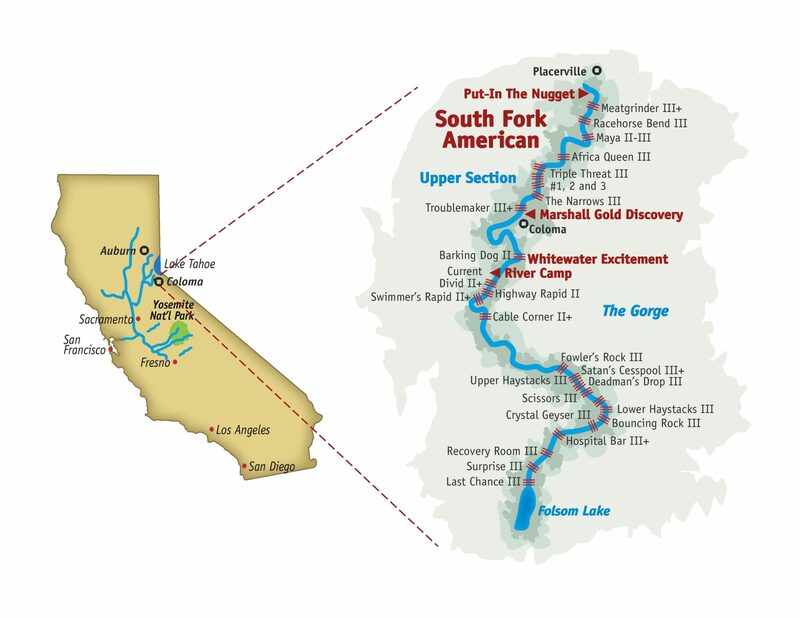 A great time to try a trip on the American River. We offer one of the best group discounts in the industry! Pay for five rafters and the 6th person is free. This discount is applied automatically at checkout on all of our trips. Scroll below to see our full list of standard trips on the South Fork. Ready to book your rafting trip on the South Fork American River? Reserve your trip directly with our Online Booking system. Not sure what trips are available, or looking for something you don’t see? Fill out our online Check Availability form and receive a response within 24 hours with more options and details.